Scientists and economists are beginning to grapple with the serious economic and environmental consequences if we fail to reduce global carbon emissions quickly and deeply. The most expensive thing we can do is nothing. See how global warming is damaging infrastructure in Alaska—and find other hot spots with cost impacts on the Climate Hot Map. 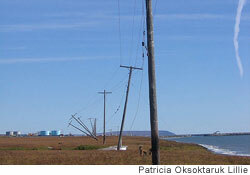 Damage to property and infrastructure. Sea-level rise, floods, droughts, wildfires, and extreme storms require extensive repair of essential infrastructure such as homes, roads, bridges, railroad tracks, airport runways, power lines, dams, levees, and seawalls. Lost productivity. Disruptions in daily life related to climate change can mean lost work and school days and harm trade, transportation, agriculture, fisheries, energy production, and tourism. Severe rainfall events and snowstorms can delay planting and harvesting, cause power outages, snarl traffic, delay air travel, and otherwise make it difficult for people to go about their daily business. Climate-related health risks also reduce productivity, such as when extreme heat curtails construction, or when more potent allergies and more air pollution lead to lost work and school days. Mass migration and security threats. Global warming is likely to increase the number of "climate refugees"—people who are forced to leave their homes because of drought, flooding, or other climate-related disasters. Mass movements of people and social disruption may lead to civil unrest, and might even spur military intervention and other unintended consequences. Coping costs. Societies may find ways to prepare for and cope with some climate impacts—provided that we do not let our carbon emissions continue unabated. However, even a partial accounting of these measures suggests that coping is likely to be more costly steps to reduce carbon emissions thereby reducing associated climate impacts. For example, farmers might need to irrigate previously rain-fed areas, cool vulnerable livestock, and manage new or more numerous pests. Local and state governments that taker early steps to ensure that houses are more energy efficient, and build early warning systems for heat waves and disasters and add emergency responders are more likely to cope with extreme events. Governments may also have to build seawalls, contain sewer overflows, and strengthen bridges, subways, and other critical components of the transportation system. Rebuilding after disasters strike is likely to prove even more costly than these preventive measures, studies show. And these costs do not include those stemming from lives lost and other irreversible consequences of allowing heat-trapping gases to accumulate unchecked in our atmosphere.